Weber's Smokey Mountain in action! Smoking is one of the best ways to bring out the mouth watering rich flavor of various cuts of meat such as brisket and ribs. They simply taste best when they're smoked until the meat melts off the bone. When smoking, foods are cooked with indirect heat, and therefore the heat source has to be as far as it can be from the foods being prepared. Whether it is charcoal, electricity or propane, the heat source is usually all the way at the bottom level of the smoking unit, with the foods at the top in a vertical setup, with trays or bowls of smoking wood and water in between. The challenge with successful smoking is maintaining the recommended temperature and keeping a steady smoke-flow. In addition, we will provide product info on the most popular smoker grill of each type that had also received the best average Amazon customer rating at the time this article was written. Selected Smoker Grills on Amazon. The most common charcoal smokers are made of a steel drum that contains a bowl near the bottom to hold the charcoal and one or more cooking racks above it. There are usually one or more vents (either on the lid or the bowl or on both). Often, they also include a water bowl between the charcoal bowl and the cooking grates to add steam to the process so meat stays moist and tender and to maintain optimal smoking temperatures. An additional effect of the water is that water vapor and smoke condense together enhancing the flavor of the smoked foods. The water bowl is also used to catch drippings from the meat that may cause a flare-ups. Wood blocks can be added to the charcoal to enhance the smoking effect. Though these smokers require some adjustment of the vents until the desired temperature is reached, they are quite temperature stable and require little or no adjustment once the desired temperature is reached. Measures approximately 21 x 19 x 41 inches. Made of porcelain-enameled steel and equipped with a heat-resistant nylon handle. With aluminum door and legs as well as individual vents on bowl and lid. Equipped with 2 heavy-duty nickel-plated 18.5-inch wide cooking grates for a total of 481 square inches, providing ample room for smoking and roasting at the same time. Has a built-in thermometer on the lid to let you monitor the temperature. Equipped with a high temperature silicone grommet that allows easy access into the smoker for temperature probes. Comes with a 10-year warranty for the bowl, lid, and center ring, and a 5-year warranty for the plastic components. Please click the image shown above for price information. Note that when you click the image, you will also get a choice for both a smaller and a larger model (with respectively 14.5-inch and 22.5-inch cooking grates) each of which come with the same features as the 18.5-inch model described above. The most common electric smokers are made of a steel chamber equipped with a heating element with integrated thermostat temperature control for even and consistent smoking temperatures. They come equipped with a wood chip tray, a water pan and one or more cooking racks. When heated, the wood chips produce smoke instead of burning, and the steamed water serves to maintain optimal smoking temperatures and also adds humidity to the smoke chamber which is also equipped with air dampers for smoke control. Some advanced models can be controlled remotely. One major advantage of these smokers is that they are equipped with a thermostat, and once you set the temperature to the desired level, you will no more need to worry about it. Measures 20.3 x 19.7 x 32.1 inches. Offers 721 sq-inches of cooking space with 4 chrome-coated racks that can smoke up to 80 lbs. of food. Equipped with a 800-Watt heating element with full foam insulation with integrated thermostat temperature control for even, consistent smoking temperatures. RF remote controller allows monitoring of temperature, time, internal light, on/off and meat temperature. Blue LED display makes reading temperatures and cooking time in direct sunlight easy. High output LED lights illuminate food in low light when door is open. Built-in meat probe thermometer for perfect results every time. Removable water pan, wood chip tray, and front access grease pan for easy cleanup. 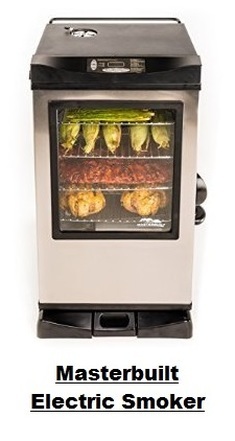 Patented side wood chip loading system to add chips without opening the smoker door. ​Side/top air damper for smoke control. ​Please click the image shown above for price information. Note that when you click the image, you will also get a choice for a model without a window. ​The most common propane smokers are made of a steel chamber equipped with a gas burner located directly under a box or tray containing wood chips that generate the smoke when heated. The box has a few vents on top, and when the burner is turned on, the wood chips in the box are starved of oxygen and generate smoke instead of burning. There is also a water bowl that is placed between the wood chip box and the cooking grates to add steam to the process so meat stays moist and tender and to maintain optimal smoking temperatures. Once again, an additional effect of the water bowl is that water vapor and smoke condense together enhancing the flavor of the smoked foods, and the bowl is also used to catch drippings from the meat. Measures 22.4 x 37.8 x 55.5 inches. Extra-large capacity with 2,000 sq. in. of cooking space on 4 chrome smoking racks that can smoke 100 lbs. of food! Dual-door design with viewing window. The large door opens to the cooking chamber. The small door gives you access to the wood pan. The dual doors are a nice feature, because it allows you to add more wood without disturbing the environment in the cooking chamber. Temperature gauge on top of door. Two 8,250 BTU stainless steel burners. Porcelain-coated wood chip tray and water pan. Type 1 regulator and hose, meaning that the connector is adapted to fit all portable LP gas tanks. ​Warranty: Masterbuilt warrants its products to be free from defects in material and workmanship under proper assembly, normal use and recommended care for 90 days from the date of original retail purchase. So which of the three smokers should you get? ​​​The three smokers considered here are excellent products as shown by the average rating each had received from Amazon customers at the time this article was written. Indeed, the Weber charcoal smoker had received an astounding 5 stars out of 5 stars, while the Masterbuilt electric and Masterbuit propane smokers had received respectively 4.5 and 4 stars. There is a good chance that you would be quite happy with any of these three smokers. ​​Weber's 18.5" Smokey Mountain is a great smoker, but if you are looking for a set-and-forget type unit, this is not for you as it will take a little bit of work and time to use and maintain it properly. But you will obtain great results. With this smoker, it’s important to start early in order to give the charcoal enough time to start up, and the liquid in the water pan to get up to temperature before you place the food. You will then make sure that the temperature stays as stable as possible by adjusting slightly the vents. The built-in temperature gauge on the lid makes monitoring the temperature very easy. Note that temperatures as high as 350 °F can be reached with this smoker though the recommended smoking temperature is 200°F-250°F. All in all, Weber’s Smokey Mountain works flawlessly, is easy to use and clean up, and delivers mouth watering succulent authentically smoked meats. Keep in mind that it also received an average rating of 5 stars from Amazon customers, a pretty rare achievement! Masterbuilt 30" Digital Electric Smoker is perfect for the beginner or the pro. It will allow you to achieve excellent results without the hassle of obtaining charcoal or propane and without having to pay too much attention to the process. Simply plug this smoker in, set the digital controls, including the desired temperature, and it does the work! The digital thermostat temperature control helps you keep the smoker at the right temperature without having to adjust vents. You can set your preferred temperature and then just focus on keeping the wood tray filled, the foods on the racks, and you're good to go. Also, because it runs on electricity, it requires smaller amounts of wood for the smoking process, rather than needing larger amounts of wood and charcoal. This allows for a more affordable smoke. Note however that the maximum temperature than can be reached is 275°F, lower than what can be achieved with the Weber charcoal smoker. But that should be no problem for most users as the recommended smoking temperature is 200°F-250°F. Masterbuilt 44" Propane Smoker is a workhorse, with plenty of room to smoke all of your favorite foods. It is a great smoker for those just starting. Temperature control with this gas smoker is quite easy as it works just like the gas burners on your kitchen range. With its push-button ignition, you just need to turn the flame up or down as needed. It's not a completely autonomous smoker, but it's pretty close. Another nice feature of this smoker is the dual front doors. The large door gives you access to the cooking chamber while the small door gives you access to the wood chip tray. The dual doors represent a very desirable feature as it allows you to add more wood chips as needed without disturbing anything in the cooking chamber (each time you open the cooking chamber, you let out heat and smoke, and therefore it can take a while to get back to the desired cooking temperature and smoke level). The above described smokers of each type are also available below. ​Please click the smoker of your choice below for price information or to purchase. Note that when you click below the Amazon links below, you will also get a choice for a smaller and a larger smokers with similar features, and for Masterbuilt also in different colors and finishes. 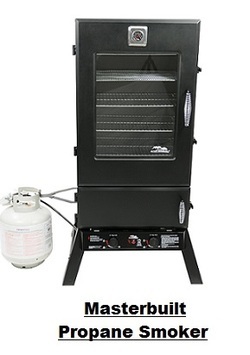 For additional information on electric smoker grills, visit Electric Smoker Grills.